Half Dyed denim~ LOVE it . So I decided to experiment. I needed a pair of beachy shorts. I did these in red at first. 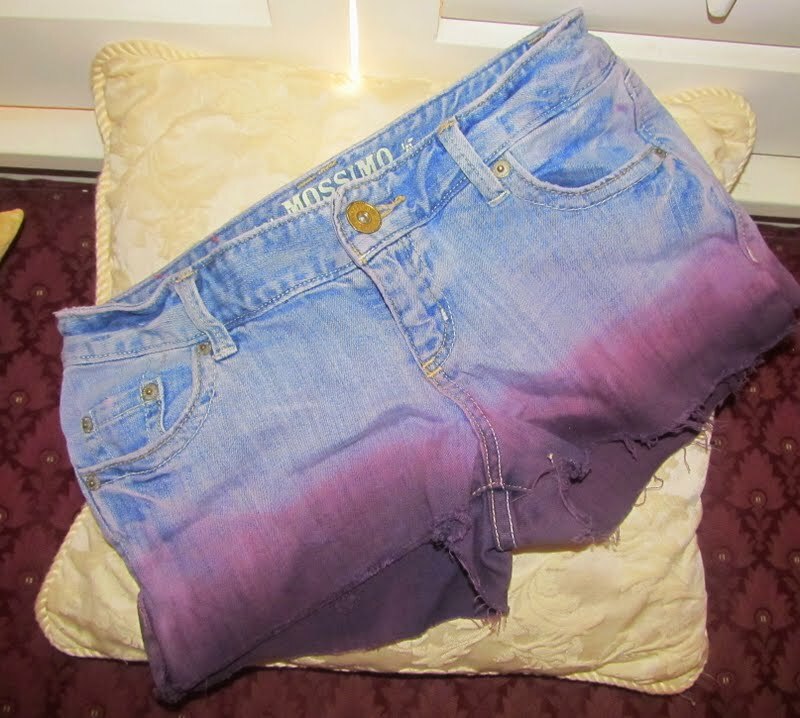 The funny things is, after my daughter saw these, she wanted to also dye her cut offs, but she wanted purple. I just so happen to have some blue dye, so I mixed it in with the red and we made her a pair. Now, hers are that ridiculously short version, but she assured me this was beach attire and for hanging out around the house. But her's are really cute. H, decided she would pose for me. After I saw this color, I decided to re- do my jeans this color. I also decided to do a pair, half purple. Magenta (fuchsia, rose, bright pink): Magenta can't be mixed from other colors. You will have to buy it. Red: Add a small amount of yellow or orange to magenta. Orange, Schoolbus Yellow: Mix yellow with magenta or red. Yellow: Yellow can't be mixed from other colors. You will have to buy it. Lime Green, Chartreuse: Add a small amount of green or turquoise blue (cyan) to yellow. Green: Mix turquoise blue (cyan) and yellow. Teal Green: Mix turquoise blue (cyan) with a small amount of yellow or green. Cyan (turquoise blue): Cyan can't be mixed from other colors. You will have to buy it. Blue: Add a small amount of purple or magenta to turquoise blue (cyan). Violet-Blue: Mix magenta with cyan or blue. Purple: Mix magenta with a small amount of cyan, blue, or violet. 6. Fold your jeans in half. Raise up your jeans again so there is only an inch left. ~At this phase I let the them sit for about an hour. I wanted them dark at the very bottom. 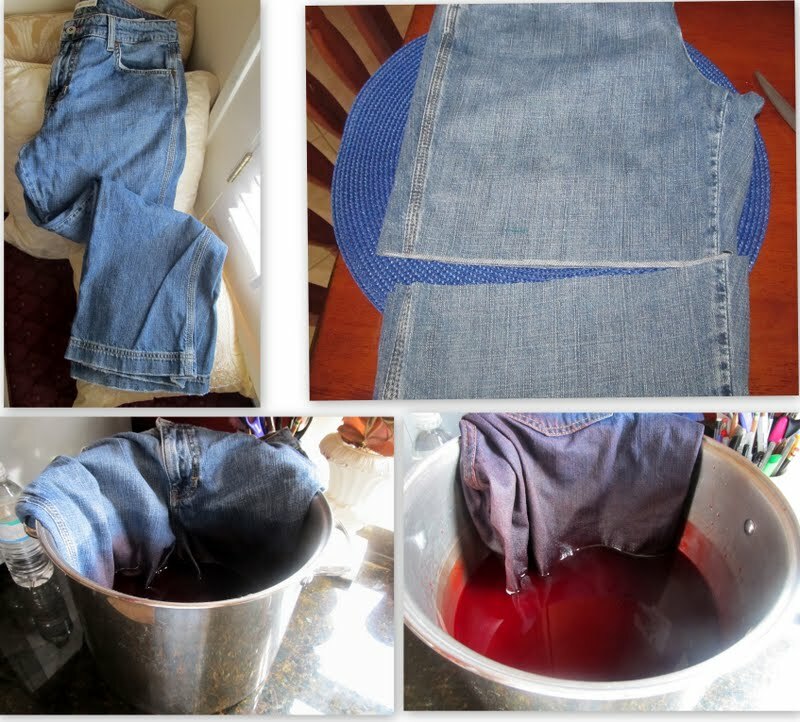 7.With your gloves on, rinse out all the dye, until your water runs clean. 8. Take a towel roll them in it, and squeeze all the water out , then hang out to dry or throw them in the dryer. 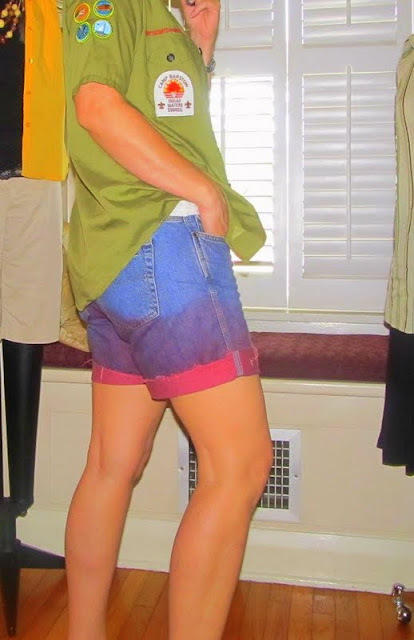 and you have new fun summer jean shorts.. OMIGOSH!!!! Ok, so many things to comment on...first and foremost you're a genius, I would never think to dye my jeans I loooove the look in purple. Secondly, hi your daughter has legs for days, lol. You are too cool.........so love this........awesome! All these shorts turned out so great! I've been wanting to try this DIY at home forever! Now I have to do it! I've been wanting to give this look a go for a while now...and you've spurred me on to give it a go. They all look gorgeous!! I love the graduated look. Gorgeous! Guest Post at Blissful and Domestic.